Some of you know I’ve been doing the struggling screenwriter thing – again – for the last couple of years, and as such, I am particularly appreciative of two of this year’s top picks for best picture: Hugo and The Artist. Both have a deeply ingrained love of film as themes in the story and I can’t help but wonder if the almost elegiac reverence toward cinema in both these films is a bellwether or a continuing anxiety, even from our best masters, of a beloved art form passing away. Today I want to rave about one such master who turns the deep concern about balance between man and nature and loss into extraordinary family films. Someone I didn’t even have an awareness of until I moved away from Los Angeles and had a child. I’m talking about Hayao Miyazayki, the master of Japanese animation. His company, Studio Ghibli, (pronounced jib-lee, a pseudo Italian term -like meliovore!- because he is a self-confessed Italianophile) is known for its inventive stories and stunning hand-painted animation. All Studio Ghibli’s major releases get lovingly re-dubbed in English and distributed by Walt Disney Studios here in the U.S. We are anticipating going to see Studio Ghibli’s latest film that has just opened this weekend here, The Secret World of Arietty, based on classic novel for children, The Borrowers by Mary Norton. Miyazaki has co-writer credit on the screenplay and, interestingly enough, I see from perusing the imdb site that the producers credit actors for separate UK and US versions – a first to my knowledge, as they often mixed British and American accents to good effect in previous films. Though most admirers mainly focus on the beautiful craftsmanship of the animation, I have always been doubly impressed that Miyazaki is as great a storyteller as he is a visual artist. His rare ability to lay out complex political rivalries and backstories, as he does in Princess Mononoke and Nausicaa is inspirational to me. If there is a single most consistent theme in his work it is the price we pay for Man’s inhumanity to planet Earth, but he handles tough themes in such a way that the films don’t feel preachy or misanthropic. There’s always hope. And atypically for films that dwell in the fantasy/future/sci-fi realm, food and cooking often plays a significant part in the story. Food is a siren song in Spirited Away, The Cat Returns and even Ponyo, where Ponyo’s love of ham is one of her earliest motivations for leaving the realm of the sea to live with her new friend, a five year old boy. 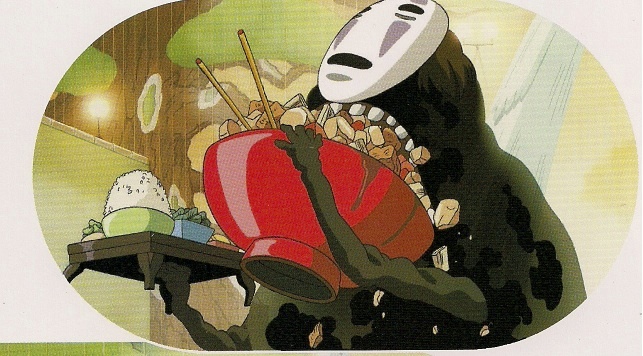 In Spirited Away, which won an Academy Award in 2002 for best Animated Feature Film when the category was but a year old (Shrek was the first film to win in this category), the parents of the 10-year old heroine are turned into pigs because they arrogantly launch into helping themselves to a spread of enticing dishes that has been set out for spirits when they don’t know what sort of landscape they have stumbled into. My blog i.d. or gravatar profile image, incidentally, is a still of Chihiro looking uneasily over her shoulder while a pig – one of her parents? – looks up at her from its pen. At the outset of the story, Chihiro is a typically self-involved and sullen young person with indifferent manners. To rescue her parents, Chihiro doesn’t shrink from the challenge of immersing herself in the world of spirits and demons as they inhabit a colorful bath-house (think spa resort) for weary spirits. It’s the beginning of her reformation into a worthwhile, engaged individual. In order to stay in the spirit world, Chihiro is told she must take on a job to be able to stay and overcome the curse put on her parents by the bathhouse’s proprietress, a wicked witch named Yubaba. As Chihiro starts her new and strange daily routine among the spirit guests and spirit co-workers, she distinguishes herself as an enterprising employee to Yubaba as a result of being kind to two troubled clients, one called a No Face spirit who is able to produce gold. The other misnamed Stink Spirit gives her a special enchanted morsel of food that will help her help a friend when he needs it most. Allowing the lonely No Face spirit into the bathhouse, however, proves a mistake. Once invited in, he begins eating everything in sight and the employees compete for the big gold-nugget tips by rushing over with the most tempting dishes for his out-of-control consumption. Unable to be satisfied, No Face starts eating the workers themselves, all the while demanding to see the human girl whose company he wants most. Yubaba becomes furious at the mayhem No Face’s rampage is causing. In her naivetee and lack of judgment toward the sadly alienated creature, it seems Chihiro has endangered them all. Through her growing empathy and understanding, she coaxes No Face into ‘giving back’ the people he’s swallowed and leaving the bathhouse. Gluttony is considered an unnecessary evil in this film, and it is also shown to be quickly reversible. Chihiro helps No Face more by continuing to accept his company on the next stage of her quest. She also gives him the opportunity to connect with a smaller, more-rustic society of new-found friends who will accept him after her time among the spirits is over. In Howl’s Moving Castle, the heroine Sophie, who is herself put under a transfigurative spell at the beginning of the film, ingratiates herself to new companions by cooking them their first good, hot breakfast in ages. In Kiki’s Delivery Service, Kiki’s ‘power’ as witch-in-training is to offer a flying delivery service, mainly serving the clients of a baker who has offered Kiki a place to live. When food isn’t seen as currency, as it often is in Spirited Away, it is often emblematic of hope and blossoming friendships. 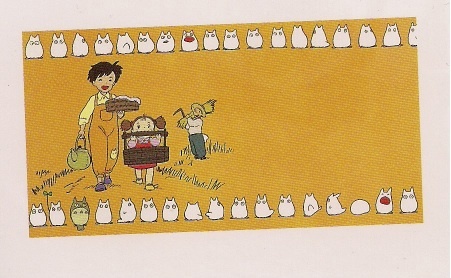 In My Neighbor Totoro, the elderly neighbor welcomes the new family to the neighborhood with baskets of food and cake – creating the traditional context for beginning a positive relationship between the families. Mei, the younger daughter in My Neighbor Totoro, causes alarm when she disappears to try to visit her mother who is sick in the hospital because she wants to bring her some fresh vegetables that the elderly neighbor has said will help to make her well again. The ear of corn, left behind on the window sill of her mother’s room at the sanitarium, is inscribed ‘To Mommy’ and leaves the adults wondering at the implied magic available to their daughters that they are too old to see for themselves. These themes around food and nourishment express themselves in Miyazaki’s films in ways which are familiar to those of us attempting to embrace the slow food movement and question the devastation in BigAg’s wake. The young protagonists persevere in defying the conventional wisdom that they cannot break the curses that hamper their happiness or the fate of loved ones. Their resistance and their bravery is shown to be an act of faith that is rewarded and shows a better way for the people around them as well. When the more balanced relationship with nature is achieved in Miyazaki’s stories, food regains its place as sustenance once more and represents healthy expressions between people instead of dysfunction and excess. No matter your age or whether or not you have children, if you haven’t seen any or all of these films, I urge you to do yourself that favor. Netflix and Amazon as well as the public library have all these titles available. Nausicaa, Castle in the Sky, Porco Rosso (what is it with Miyazaki and pigs? ), and Princess Mononoke have more serious adult themes around war and conflict than school age children may be ready for. If you are already a fan, I’d love to hear what some of your favorite titles are and whether your kids are fans too. The musical scores to these films, by Joe Hisaishi, are just beautiful too and import CD’s are available. I highly recommend the Totoro soundtrack and Nausicaa’s score if you enjoy film music. Here is a filmography of Mr. Miyazaki’s films, courtesy of Wikipedia. The links will take you to other detailed Wikipedia articles. I wish you great movie viewing and discovery of new filmmakers to love.